In the fall of 2016, I worked on a semester-long user research project exploring how to improve the transportation system for graduate students at the University of Michigan going to and from Detroit Metropolitan Airport. In the fall of 2016, I worked on a three-month long project to improve student collaboration at the Munger Graduate Residences, a residential community at the University of Michigan consisting of over 650 graduate students. After over 50 sketches, several paper prototypes, two hi-fi prototypes, and working with potential users throughout the process, I designed a digital prototype of a mobile application to be potentially used by the community. 1. Students aren’t currently able to easily find and collaborate with one another to be able to push forward their ideas to make positive changes to Munger. 2. There isn’t a central platform or system in the place used by the vast majority of residents to encourage this type of collaboration. Understanding the strengths and weaknesses of other platforms, like Google+, that Munger residents used to communicate and collaborate together was an important initial step in the design process. As a member of the Munger community, I knew the problems intimately and came up with the original goal of the project: to create a mobile application or website that allows students to better collaborate and connect with one another, ultimately creating a stronger community. I conducted a competitive analysis to better understand the strengths and weaknesses of other potential competitors (such as Google+ and Facebook). I found that these platforms didn’t solve the unique needs of the Munger community, as they were more geared towards quick conversations. My design philosophy for this project was to create a solution that was simple, yet powerful and easy-to-use. With the problem space defined, I began brainstorming potential solution ideas and focused on ideating a large quantity of disparate ideas. After these initial sketches, I spoke to several Munger residents, showing them these initial ideas and then making some tweaks to produce eight storyboards (one storyboard for each potential solution). The Facebook and Google+ page aren’t good enough...I want to connect with like-minded students who are also passionate about getting together to have dinners and cooking lessons. In order to better understand my target audience (Munger residents), I crafted developed four personas based on my interviews with potential users as well as my inherent knowledge as a member of the community. 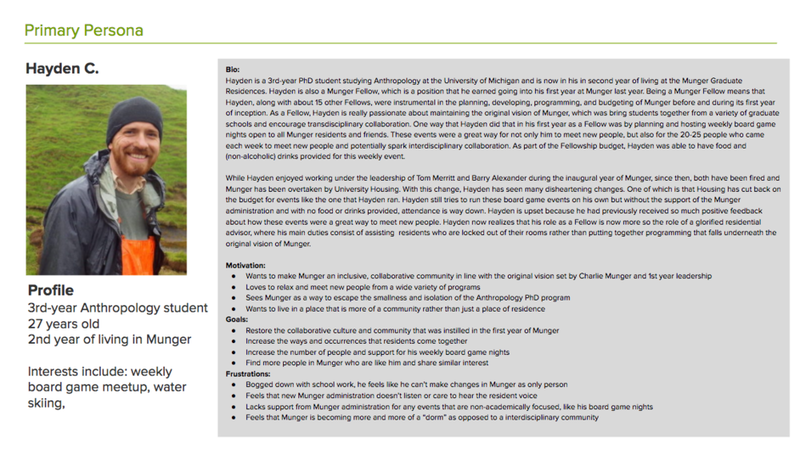 The primary persona was a Munger resident who is actively involved in the community and eager to meet other residents and engage in trans-disciplinary collaboration. With feedback from potential users during the Storyboarding process, I made further edits to put together a paper prototype that. There were three main tasks (outlined below) that the user could go through in this version of the prototype. One of the pain points uncovered was the need for residents to hear from others what ideas and projects they were working on. The first feature area of the app, therefore allows residents to learn more about ideas that other residents are interested in, reply directly to those ideas within the app, and express support by up-voting ideas that they love. The app is meant as the first step towards greater student collaboration. After a user interacts with others inside the app, the goal is then to bring this interaction off-line. Within the calendar, which would be designed to integrate with a user's Google Calendar (which is used by all UM Graduate students), users are able to set up off-line meetings to push forward the ideas that they support. Finally, users are able to easily add their own ideas that other users can respond to, vote on, and work with off-line to push this particular idea forward. As a designer, I had to contemplate what values and attitudes that I wanted this app to exude or that even certain design elements would inherently exude. Since the mission of Munger is to encourage student-initiated, transdisciplinary collaboration, I wanted the app itself to emphasize positivity, transparency, and community. For instance, when I say positive, for instance, a design decision I had to make was whether to allow users to both upvote and downvote ideas on the idea board. I did not want to introduce any negativity into the app, so I decided against allowing for downvoting of ideas. Although this project was for an Interaction Design class that focused more on design elements and interactions rather than research, I wish I had been able to bring in more stakeholders into the research and design process of the application. I was able to interview four potential users repeatedly throughout the design process, but it would have been nice to also interview Munger administration and former residents to potentially gain new insights. Looking back, what I would have done differently is include more potential users and a wider variety of stakeholders throughout the design process of this application. Although, as a entrenched member of the Munger community, I do and did have insights into the unique problems and needs of many of those around me, I think there could have been a greater and more disparate amount of insights and findings if I could have included a more diverse stakeholder list throughout this process.